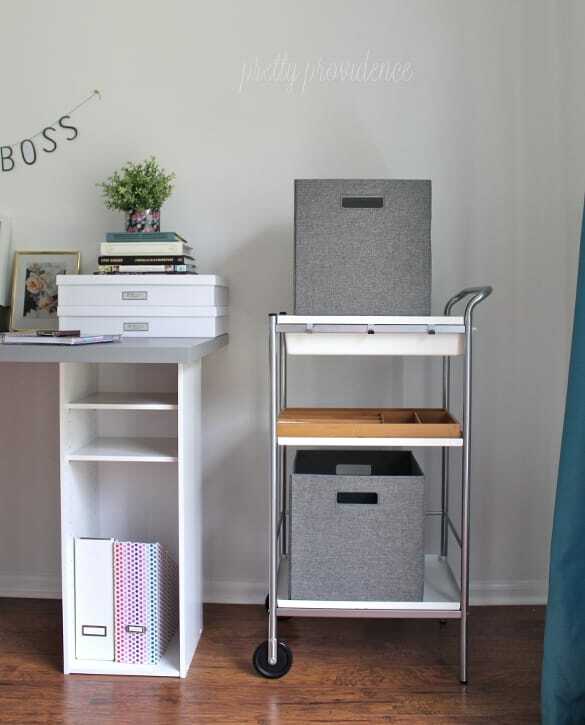 This IKEA hack desk is easy to make with a cheap IKEA desk top and two small shelves. 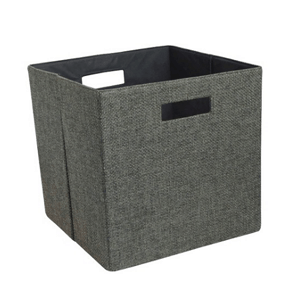 It’s perfect for a home office or any small workspace! I am loving my new house, but I’ve got a few completely empty rooms. Sure, we’ll fill them with the furniture they deserve with time, but I decided one of the highest priorities was a desk for my office. 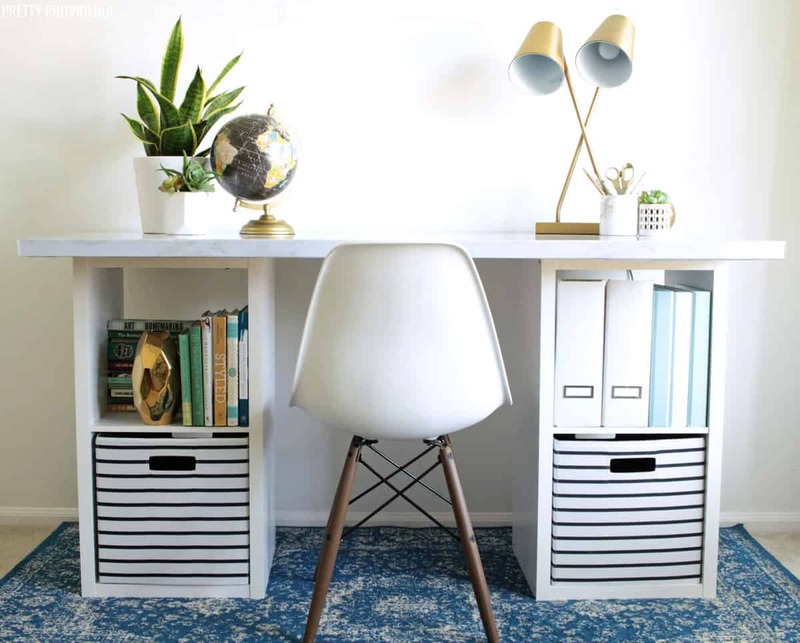 We needed a cheap desk as soon as possible, so I looked at all the IKEA office ideas, and this beautiful IKEA hack desk for under $60 was born. So, I went back and forth about what I wanted for a while, but as time was ticking by and I still had no desk I began to feel desperate. So, I decided to DIY. I just wanted it to be easy and functional as possible. What I ended up deciding was to get two small bookshelves from Target ($18 each) and then a big butcher block desk top or counter top from IKEA. But those were going to be a little more of an investment than I felt I should make at this point. So, while I was at IKEA staring at the pretty butcher block that I wasn’t feeling the price of, the gray LINNMON desk top spoke to me. It said “I’m going to be cute, just put some pretty things on me. Really, I’m on sale for $19 and you can even fit me in the car.” So, it convinced me. We took the gray desk top home and moved forward, feeling really good about the price tag and okay about how it would look. I could have done this myself, it was that easy, but in full disclosure my husband did help me. We like to do projects together. 2. Measure where you want the bookshelves to be and make sure they are even. 4. Drill them into place. So, I looked at it and almost had second thoughts, but then I remembered my white and silver cart (also from IKEA, only $25!) that I had gotten for Christmas. I thought, actually, these look really nice together. So, a few accessories and organizers later, I think we’re in business! I still have big plans for an art wall above the desk to keep the inspiration really flowing. For now I decided to hang up a little banner. My favorite phrase is “like a boss” and I feel like it’s perfect for the office because it’s a little bit funny and a little bit encouraging. I should add that I could have just gotten IKEA desk legs too, but I really wanted a desk with storage shelves. I have no other furniture at the moment, remember! Another plus, the shelves hide my cords! I can plug everything in and it’s all just tucked behind the shelf. If you like the Andy Warhol-inspired heart print above, you can print it for free right here! I’ve gotten a lot of questions since sharing this tutorial. Here are some of the most common questions and answers. How tall is this desk? 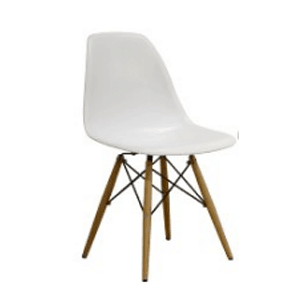 Where can I find the bookshelves, chairs or bins you used? Here are the quick links to the items I have used for this desk! *These are affiliate links. Yay! So glad you like it, good luck Linda!! Yay! Thanks so much for sharing! We’re glad you liked it! OMG – LOVE IT! Totally going to steal this idea and set this up for my daughter when she is on vacation with her Dad this summer!!! She will LOVE IT!!! Ah what a fun surprise!! She will love it!!! Can you share the Target shelves model name? I wanna see how high is this after building. The Martha Stewart cube organizers are way too high, and are good for a standing up counter height craft desk. This is fantastic! I need a desk badly, and thought I might buy one secondhand, but none of them fit in my tiny car. So, I thought I might build one, but I have very few tools, and even fewer building skills. This is perfect! Thanks for sharing! Yay!! We’re so glad! You will love it! hey! I love this desk, such a unique creation! I decided to use this idea except with a black top. But i absolutely love it! However, i have a question. Whered you get that banner? I love it and want it saying something else. Thank you!! do you know the model number of the desktop? or the name, cant seem to find anything like that on ikea! i love your desk! I see you got the bookshelves at target. How tall should the bookshelves be to make the desk work well? Your desk looks really great. I’m so happy I came across your post. I was thinking of making a similar desk with 2 6 cube storage shelves for my crafts. I was wondering what to use as the desk surface. The Ikea desk top would work perfectly, and Its a great price. 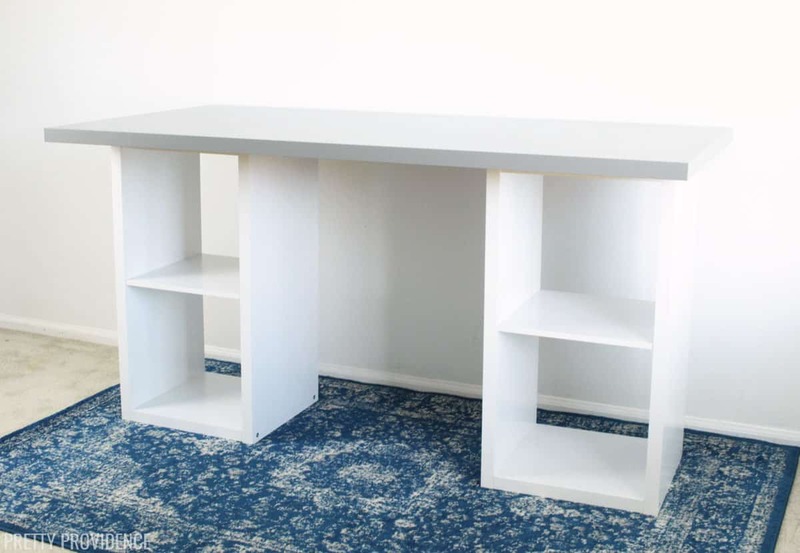 What are the dimensions of the desk top?? Can I ask you how high the white little tables are ?? I don’t have any pictures (sorry!) but we didn’t use any hardware, just 1/2 inch wood screws and used a drill to put them in place! 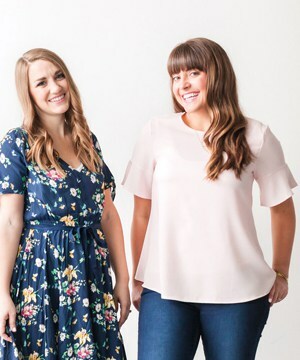 Sarah — I love this idea and am planning to copy you! Can you tell me exactly how you secured the Ikea top to the Target shelves? Before I go out and buy the product, my hubby wants to know how he secures it all together. Thanks. Shalene. Hey Shalene! Yay – I’m excited that you are going to do it. We put the desk top face down on the floor, measured where we wanted the bookshelves to be and made sure they were even, placed the tops of those on the bottom of the desk top (so the desk is essentially put together but upside down) and screwed them in place with a drill. My husband said he used 1/2 inch wood screws! Could you show the screws and hardware you used to put this together? I don’t want to mess mine up!! Would like to duplicate, what was the exact name of this “butcher block”, the IKEA site comes up with a dozen pages when I search that. Thank-you! I don’t know the actual name of the butcher block since that’s not what I ended up using. The desk top I used is called the LINNMON! I. Love. This! I’ve been looking for an idea for a new desk and this is perfect! I’ll be adding this to my apartment this weekend. I also stopped by Home Depot and they have sheets of clear acrylic that they will cut to size for me (as a topper) to protect the desktop and I can put something decorative under the acrylic. Yes! 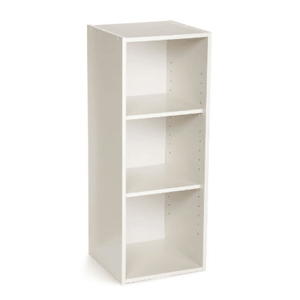 This is almost the same as the shelf I used: http://bit.ly/UG75Yp -it looks like the exact one is not in stock anymore, but this is similar and they are even cheaper! No longer available! 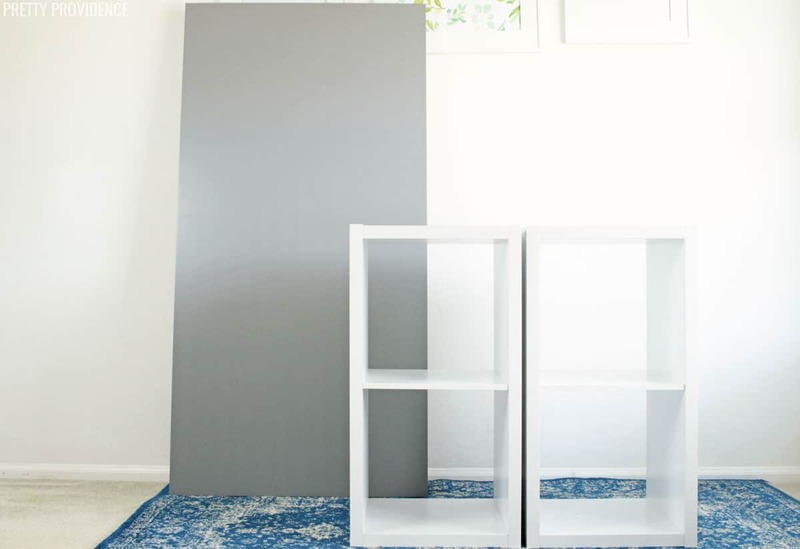 :( Can you tell us what height the shelves you have are so we can look for something similar? I love this idea and would like to try it but I can’t seem to find the right bookshelves. I keep finding the more rectangular ones, not the square ones. I looked at target too and couldn’t find them. Could you post the link where you found them? 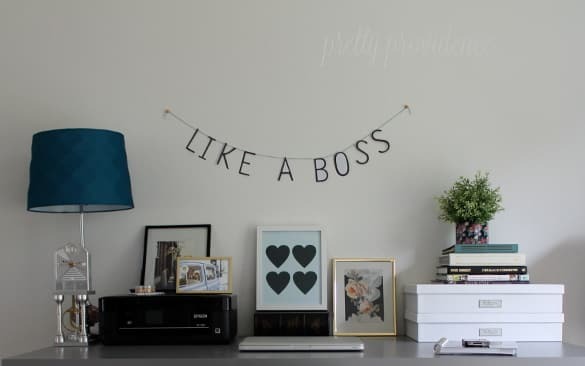 I really love the “Like A Boss” banner and am wondering how you made it or where you bought it. What material is it made of? Excellent! so simple :) thanks for the details! Hi, Could you tell me what font the Like a Boss sign is in? I really love this font? I hope you visit and like it! Sara where did u get the “like a boss” sign? can’t find the book shelves at target…any clue where else I can get them at? Loved this! I just bought all the pieces. I went with the high gloss red top for the pop of color in my boring apartment. Do you know the dimensions of the top? I really want to make this!! Also, are the bookshelves centered in the middle of the top? Love your banner! it will definitely be added to my office that is slowly coming together. 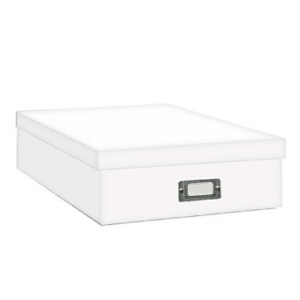 What would you recommend for someone that doesn’t have an Ikea near them as the top? i’m in the same predicament of not being able to find a desk that I want! Yes actually! Before we decided on the IKEA desk top, we were looking at Home Depot and they have doors there, big unpainted slabs of wood basically. They were totally flat too. We were about to get one of those and just paint it! I think they were $20 or $30. Does it wobble? I have that table top and the legs are small so it wobbles. I have basically just dismissed the desk for a while and started piling stuff on top instead of using it… but this looks like a good solution. Actually no it is as sturdy as an oak. Something I should have mentioned in the post is that these particular shelves make the desk a few inches taller than average, but I hardly notice, it’s still comfortable to work at. What a great idea, I love it! 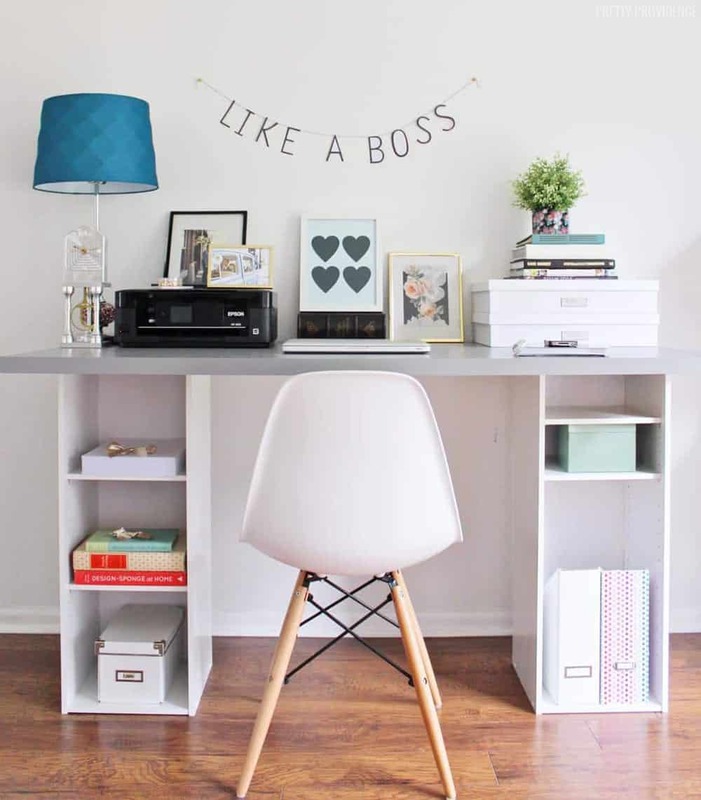 You did a fantastic job creating an office space on a small budget! Also I need to ask you about your printer…we’re are thinking of buying what looks to be the same one you have. Would you recommend it? Sarah, that turned out so nice! I love what you did! Good job girl!! Thank you Pam! :) I’m so excited to party at SNAP! Love the desk! I’ve been really into the color gray lately so I’m glad you decided to go with that even if it was just for the price ;) The final result is so cute. Thanks Hanna!! I know now I feel silly for doubting myself because I just love it and it really allows me more freedom than even the natural wood might have! I would never think to do that. I would be all “Ikea top, where is the Ikea bottom?” This looks so good and modern. And it was cheap. Only my husband and I are incapable of measuring so if I wanted to do this, can I borrow you guys? I will pay you in fist bumps and BBQ. Yes you can definitely borrow us. My husband loves BBQ and I love fist bumps! Oh my gosh Sarah I seriously LOVE this! I think it turned out great and you could make it work in basically any room in those colors. By the way, I totally burst out laughing when I first saw the “like a boss” banner. I am totally adding that to my future office somehow. Thanks for sharing!